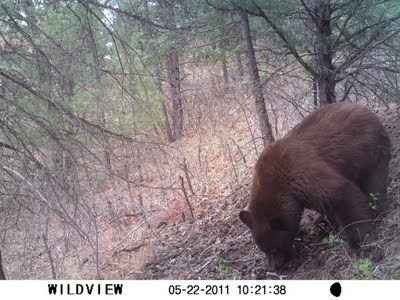 Colorado black bear — and there are maybe 20,000 more? actually describes a study in Summit County, but it is not the only one. Researchers found that in every study across the state, in habitats that ranged from good to poor quality for bears, the bear population was double the numbers wildlife managers had been using before. Meanwhile, an incident in New Jersey reminds you of the old joke that you don't have to run faster than the bear, you just have to run faster than the next guy. But Rutgers University student Darsh Patel might still be alive if he and his friends had acted sensibly. "The hikers broke off in different directions . . . " Not a good idea. If champion sprinter Usain Bolt was matched against a black bear over fifty yards, I would bet on the bear. Our ancient ancestors no doubt realized that they could not outrun big bears, big canids, or big cats. I suspect that five people standing solidly together, yelling, and throwing stuff would stand a better chance of continuing life. Three Coloradans have been killed by black bears since the 1970s, which is a low percentage considering the number of bear encounters. (I have lost count of my own.) Most black bears are shy, but a few are not, either because they have become used to a human-provided food source—or, in some cases, because they may just be extra-aggressive individuals. Wikipedia's North American Fatal Bear Attacks database is worth reading. It is not always possible to see what caused the incident or whether it was food-related. UPDATE (Nov. 27, 2014): Patel's cell phone photos have been released. Was this a "mugger bear"—one that had learned to intimidate people in order to get food?